The XFL-1 experimental shipboard fighter was developed in parallel with the XP-39 Airacobra, and was flown for the first time on 13 May 1940. Powered by a 1150hp Allison XV-1710-6 12-cylinder liquid-cooled engine, the XFL-1 differed from its land-based counterpart primarily in having a tailwheel undercarriage and underwing radiators. The airframe was re-stressed for shipboard operation, and proposed armament comprised a single 12.7mm machine gun or a 37mm cannon firing through the propeller hub and a pair of fuselage-mounted 7.62mm guns, although, in the event, no armament was installed. The XFL-1 failed its carrier qualification trials and further development was abandoned at the beginning of 1942. It seems the XFL-1 sacrificed everything to carry enough fuel to impress the USN that it wasn't short range like the Army P-39. With drop tanks, the XFL was about 2,000 miles max range! I found the loaded weight was 6,651 lbs for a powerloading of 5.8 lbs/hp and with a 232 sf wing, wingloading was 29 lbs/sf. Perhaps this weight was without guns. Climb rate was only 2630 f/m, and 9.2 minutes to 20,000'. For 1940 it was still not a contender. I have a solution: The B-5 turbo need not be held back from the Airabonita. The Army didn't need to know. Their decisions with ground air support bias should not have reached into the Navy. The Navy ordered this prototype because of that turbo performance in the XP-39. The XFL sorely needed it. Top speed of the XFL was only 336 mph without it (not 307. That was at lower altitude). Turbo power allows for adding more guns for dogfighting. At least 2 more for a dense pattern of fire. Next, I would not change the strong main gear position, just delete the nose wheel for a tail wheel. This avoids the underwing scoops that slow it down with too much drag. The existing wing intakes were fine. The lighter firepower is OK against early war Japanese planes. I like that the wings were gun free, for better roll-rate. How many USN fighters had fast, long-range hub guns? This fighter had that cornered. This Bell fighter had very short take-off too. Another plus was the W/L that other Bell P-39 fighters couldn't touch. This meant the P-39 spin or stall issues were no big concern for the better handling XFL. Any armor it may need to add could be traded with a bit of the excess fuel load. The Navy had an opportunity here to show up the Army with the potential of the turbo Bell fighter. The Army only allowed turbos for the P-38 and bombers. Not P-39s. But the Navy Bell is outside their reach. Could the Navy supply the rare tungsten for a more reliable turbo? They chose to go with the Corsair instead. Who can begrudge that? Could the turbo have made enough of a difference? The loaded weight here must include the 2x.30 Cals and hub .50 Cal. Adequate in 1940, but with turbo power, add 2 more .50s for dogfighting with a better dense pattern of fire. Heck, make it 5x.50s! If more protection is needed later, just give up some of the excess fuel load. Range with drop tanks was around 2,000 miles. The big wing area and tailwheel make for a very very short take off. the handling would be good enough to minimize the stall and spin issues dogging the Army P-39. Without the turbo, speed was 336 mph; climb to 20,000' took 9.2 minutes. Initial climb rate was only 2630 f/m. If the Navy could supply tungsten to make the B-5 turbo reliable, they could have shown up the Army on the potential of the turbo Bell fighter that caught their attention when the XP-39 flew 398 mph at 20,000' which was reached in 5 minutes flat! This unfortunate airplane had a lot of things going against it right from the start. Land-based pilots were nervous about having that large, heavy engine behind them in the event of a crash, and I imagine that the carrier-based Navy aviators must have been doubly dubious about it. In addition to that, there's the matter of the cockpit doors. Carrier-based Navy aviators liked to have the canopies open during take-offs and landings, just in case they came down in the drink. I don't imagine they would have been overjoyed at the prospect of those car-type doors, with their crank-down car-type side windows. Yet another strike against Bell fighter was the Allison engine. It wasn't simply a question of whether the engine came with a turbo-supercharger or not. Stowage space for spare parts was always at more of a premium on an aircraft carrier than it was on any land airbase. Consequently, the Navy preferred to limit the number of different types of engines it used on it's planes. Although there were lots of Navy planes that used the ubiquitous P&W R-2800 engine, the Airobonita would have been the only Navy plane equipped with an Allison engine. It simply wouldn't have made sense for the Navy to buy an airplane that required it's carriers to stock spare parts for a whole other kind of engine. XFL-1. Sobering to reread what I wrote last night. I couldn't even keep those letters in order. If the nose-heavy Corsair could get in a burst of fire at a Zero in the beginning of a turn, certainly a mid-engine design could too, even more so with unweighted wings. Pilots used to conventional front engine fighters would remark on the instant ability of the P-39 to point it's nose into a turn 'right now'. Just stay away from the stall after the shot, that's all. Lost out to the more promising F4U. Even outclassed by the F4F before it. Engine and landing gear trouble dogged it's 1941 U.S. Navy debut. Compared to the powerful Corsair it was an underpowered embarrassment. Just look at the numbers. Enough motivation for Bell to hijack a P-38 engine? The turbo-less Allison 'grenade' power-plant couldn't fly with the Wildcat up high like the Navy wanted. With a lost cause like this XFL-1 should Bell have taken off the gloves ala Howard Hughes and built a 'single engine P-38' in the Airabonita to compete with the Corsair while it wasn't deck worthy? The Japanese had equal regard for both the Lightning and Corsair. 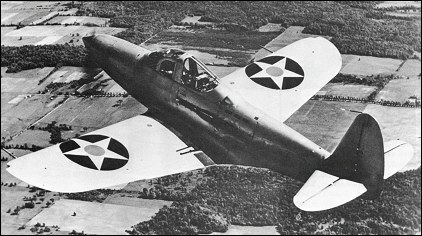 The Army had the P-39 in action when needed, meanwhile the turbo could have been perfected on the Navy XLF. This answers the excuse that the P-39 couldn't have answered the call in strength of numbers except as is. The undeveloped turbo-supercharged Allison could have gone forward with the Navy (that did appreciate performance at altitude, if the Army didn't). Then Bell would soon have a cure for the underpowered P-39 as well. I can feel Bell's frustration when I look at this photo. Here they have a tail dragger to avoid the P-39s long take-off run so it could be a fast climbing, hard hitting interceptor for the carrier groups. But without the turbo the Army made it a shadow of Bell's dream. Maybe the Navy should have seen to it that their XLF didn't get castrated. If they were going to be in a furball with lightweight tight-turning fighters, having a lean and powerful mid-engine interceptor could have been a handy weapon as the Russians later proved. They stripped off the Cobras' wing guns and such, exchanging heavy slow firing nose-guns for light and efficient Soviet weapons over time. After defeating Hitler, one of Bell's Russian P-63s shot down a nimble Nakajima Oscar at the end of the war in the Pacific. Too bad Russia did what the U.S.A. didn't do. Appreciate Bell's Cobra and make it the mount of more Allied top aces than any other American-made fighter in history!